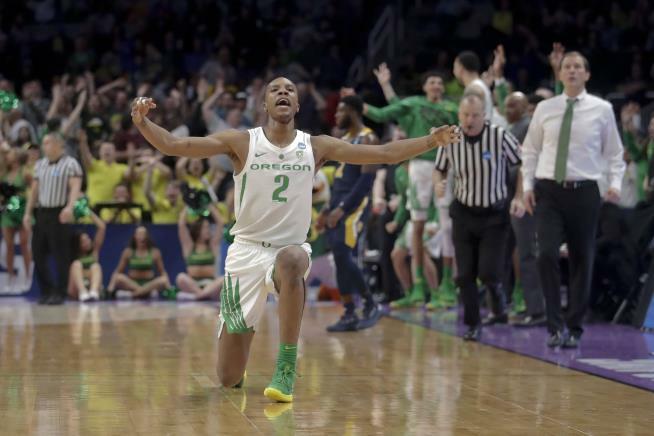 (Newser) – The Sweet 16 is set, and one of those 16 is Oregon, which easily beat UC Irvine 73-54 despite the losing coach's name-calling strategy. As the Oregonian reports, Irvine coach Russell Turner kept referring to Oregon freshman Louis King as "queen" during the game. But, he swears it was "out of respect," citing a chess analogy. "I was saying 'double team queen' to try to see if I could irritate him, and I did," Turner said after the game. He had his players do the same. "We were calling him queen, because I knew it might irritate him, because of how important he is to their team—the queen in chess." Hardly an insult considering the actual Queen of College Basketball is Sabrina Lonescu, the star Guard for the Oregon women’s team (also in the Sweet 16 and serious contender for the National Championship) who set an NCAA record for the most Triple Doubles (18) in a single season (for both men’s and women’s basketball). Go Ducks! Typical of Americans in sports. When you're a failure trash-talk the real winners. I'm a rugby player, where we kill each other on the field and then both teams get drunk together after the match, but there's never any trash talk. That’s a weak play. If you can’t win off talent, try winning off distractions.